The more humming bird information you have, the more you will appreciate these backyard visitors. I hope you enjoy my collection of facts about the hummingbird, and also hope you will share your humming bird pictures and sightings with us! Having humming birds visiting your backyard bird feeders is a treat and a privilege that will bring you hours of enjoyment. With humming bird information at your finger tips, you can make sure that these jewels of nature are getting the best attention from you. And you will grow in appreciation for your entertaining feathered friends. Hummingbirds flap their wings up to 90 times per second. Watch how they hover delicately just out of reach. To maintain this power, their hearts beat 1,200 times per minute, and they need to consume their own body weight or more every day. Hummingbirds may visit 1,000 flowers per day. Did you know that hummingbirds actually broadcast colour. The colour that reaches your eye is created by pigment, which absorbs some colours from sunlight and rejects others. Just like soap bubbles, hummingbird's colour comes from iridescence, not pigment. It blinks on and off, depending on the light source and the angle of the viewer. This allows hummingbirds to flash colours or hide them, enabling males to impress females or threaten other males. Hummingbirds prepare to migrate in Spring. They complete their non-stop 500 – 600 mile journey in less than 1 day! Can you imagine that? Migration is part of the hummingbird life cycle; they follow the sun and the flowers as they bloom across the continents every year. You can enjoy seeing about 16 species of hummingbirds in the U.S. and Canada. It was thought that you could only hope to see Ruby-throated hummingbirds east of the Mississippi River; however, research has documented 11 other species of Hummingbirds in the east. Hummingbirds do not mate for life. The male hummingbird is not involved with raising the young, the female raises the young on her own. Females will lay two white eggs and will produce only one brood per season. The chicks remain in the nest for three weeks. Many people think that hummingbirds have a hollow tongue like a straw. But they actually lap up the nectar with their tongues. The tongue is shaped like a "W" and uses capillary action to absorb the nectar. Watch a hummingbird in flight... It is amazing!A hummingbird is able to rotate each of its wings in a circle which allows it to fly up, down, forward, backward and sideways. To hover, hummingbirds move their wings forward and backward in a repeated figure eight. They can stop in midair and change direction at a whim. 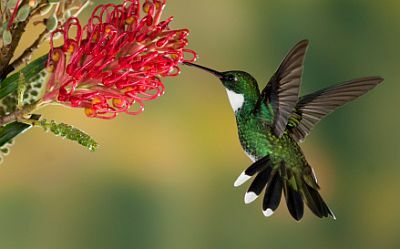 Hummingbirds can even escape quickly from a flower by flipping into a backwards summersault where they briefly fly in reverse while upside down!Some people think that hummingbirds fly faster than most other birds. This is not so – it only appears to be so. Because they are so small, when hummingbirds fly you can barely see them and this makes it seem extremely fast. Hummingbirds can live 5-6 years in the wild. And they are the smallest bird in the world. The first Spanish explorers to the Americas called hummingbirds Joyas Volardores or flying jewels. The romantic Portuguese name for them isBeija-flor or Flower-kisser. Isn't that lovely? Hummingbirds are very territorial and will aggressively protect their feeding spots. 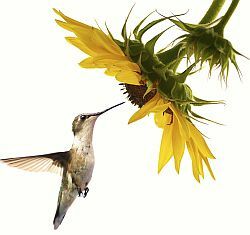 So you can use this humming bird information and have several feeders, out of sight of each other, to prevent one aggressive hummingbird from dominating your nectar feeders. Using the right hummingbird food recipe will ensure happy and healthy birds who keep coming back for more. The ruby throated humming bird is a regular visitor to gardens. Learn more about this delightful bird. Also enjoy learning more about the black chinned hummingbird. Our best humming bird feeders will make sure that you satisfy the hummers and get hours of enjoyment in your garden.